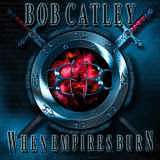 This album marks the fourth solo release from Bob Catley, the lead singer of Magnum. His first three releases were collaborations with Ten's Gary Hughes however, this time he's chosen long-time keyboard player Paul Hodson as his writing partner (and producer) for When Empires Burn, the follow up to his very successful Middle Earth album from a couple of years ago. I have to admit that I wasn't very familiar with any of Bob's solo work or his work with Magnum until I heard his voice on the Avantasia albums. His powerful and unique voice really reminded me a lot of Phil Mogg from U.F.O. with it's character and I immediately liked his singing from the first time I heard it. Gary Hughes used Bob on the recent Once And Future King project where once again, his singing provides some of the high points of the whole project. I love a vocalist who has an instantly recognizable sound and style. With When Empires Burn, Bob has delivered what many consider to be the album of his career. A great mix of melodic heavy metal, more traditional heavy metal and even some more AOR style tracks are all interwoven flawlessly into an almost perfect album in the genre. More pounding heavy melodic metal can be heard with tracks like Children Of The Circle and The Prophecy with tracks like Someday Utopia taking a more charging heavy approach. Tracks like Gonna Live Forever, I'll Be Your Fool, Every Beat Of My Heart and Meaning Of Love have more of a lighter AOR feel to them with the choruses but with great thick power chord guitar throughout. The title track, When Empires Burn sounds very much like something from the Once And Future King project with it's dramatic mid-tempo style and great emotional feel. The last track, My America is filled with celtic flavors and even has an Auld Lang Syne (the New Year's song) feel to the melodies. This track deals with the emotions and turmoil felt by the Irish who left their homeland hundreds of years ago for a better life in America. The production on this album is crystal clear and Bob's voice sounds as good, if not better than ever. Soaring and expressive Michael Schenker style lead guitar is found on most tracks and adds warmth to an already overflowing melodic metal style. I love the flow to this album and there's many melodies and choruses that you'll walk away singing. I also love the songwriting style on this album. Some tracks start with the chorus section whereas others follow a verse/pre-chorus/chorus style that works incredibly well with the richly melodic style of this album. Even though many of the tracks have a lighter feel to them with the vocal styles and choruses, the guitars are still very prominent in the mix and I think this album is some of the more heavier stuff I've ever heard him do. The rich sound with a great blend of piano and synthesizer along with the heavy guitars and Bob's soaring emotion packed voice all combines to deliver one of the best melodic metal albums I've ever heard. I thought the Once And Future King albums were pretty much as good as the genre gets until I heard this one! I'm almost inclined to give this album a perfect score but I'd like to leave room if he ever comes up with an even better album than this one. I can't recommend this album enough; a perfect mix of melody, heaviness and great emotional vocals. I think this one's going to slowly work it's way into my top albums of the year.